In 2008, Coca-Cola celebrates 125 years of Coke. In the same year, Rex, a small Joburg-based company of designers, turns four. Despite the marked age gap, however, the world’s largest and most valuable brand has invited Rex to participate in its global birthday celebrations. The project, dubbed Coca-Cola Remix, sees 125 artists from around the world taking 125 years of Coca-Cola marketing material and re-inventing it to create a series of fresh visuals inspired by the brand’s new global positioning statement – the Coke side of life. 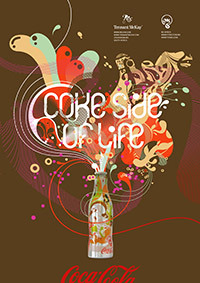 Each ‘artist’ – which includes icons such as Sir Peter Blake, who designed the cover of the Beatles’ Sgt Pepper’s Lonely Hearts Club Band album, as well as creative collaboratives such as Rex – was given unlimited access to Coca-Cola’s archived marketing material, and invited to re-interpret these visuals in their unique style to bring the Coke mantra of “happiness in a bottle” to life. Rex was the only creative collaborative from South Africa invited to participate in the project, placing the company’s work alongside artists stretching from the United States to Brazil, Indonesia to Japan, and Spain and Switzerland to Senegal. On a broader scale, it places Rex alongside cultural art icons such as Sir Peter Blake, Keith Haring and Andy Warhol. “It is a great honour to be involved in a project of this nature, not only because of the stature of the brand but also because of the enormous strides that it represents for marketing as a discipline,” comments Rex co-founder Rudo Botha. Both Botha and his partner Olivier Schildt believe that branding – if it is to be really successful – needs to exist as more than a commercial message. It must stand for something, and that something must be meaningful to its target audience if the brand is to be integrated into daily life. In addition, they also believe that consumers must be allowed to participate in the creation of this meaning, and thus in the branding process.